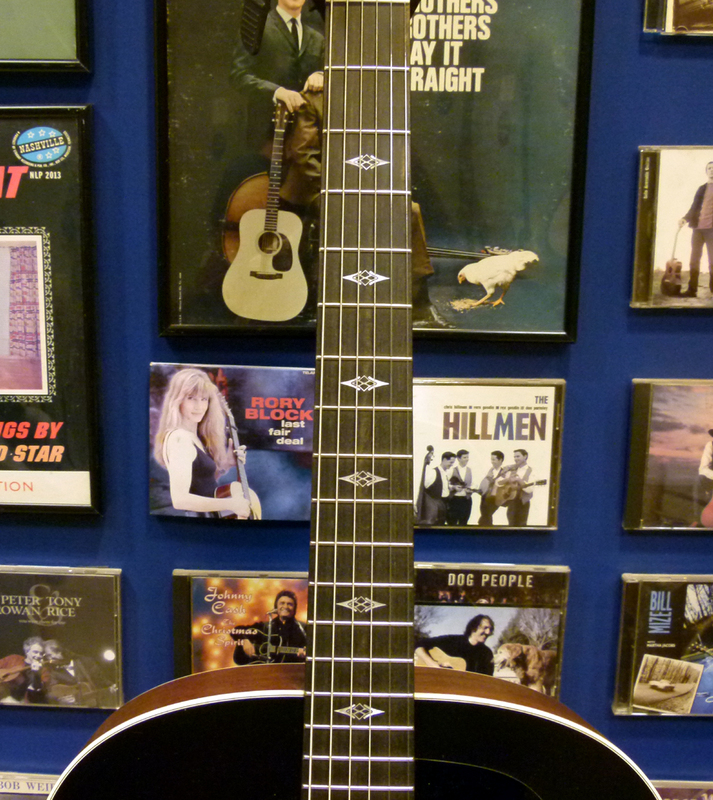 The Martin CEO-8.2 is the ninth guitar in the CEO Series, designed by Chief Executive Officer, C.F. Martin IV. But since it is basically a “reboot” of the CEO-8 from 2015, he chose to give it the designation of 8.2, rather than call it the CEO-9. Whereas the CEO-6 had different versions with different colored finishes, each was called “CEO-6” since they were otherwise identical in terms of tonewood and construction. The CEO-8.2 has more differences than just the color scheme in its finish. The CEO-8 has a back and sides and neck made from domestic American sycamore, a wood rarely seen on acoustic guitars. This year’s offering is made from traditional Big Leaf mahogany from South America, the exotic tonewood the Martin Company has used across the past century. In fact, 2017 marks the 100th anniversary of the introduction of mahogany back and sides to the main line, on the guitars built in Style 18. And this new model likewise exhibits Chris Martin’s earnest avocation of environmental conservation and the conscientious management of the world’s natural resources. All of the tonewoods on the CEO-8.2 have been certified by the Forestry Stewardship Council, an independent, non-governmental, not for profit organization promoting and ensuring responsible management of the world’s forests. This includes the ebony used for the fingerboard and bridge, and the European spruce used for the top and bracing. But it is particularly poignant where Big Leaf mahogany is concerned, as it is vanishing from the wild rain forests at an alarming rate, and safeguarding efforts cannot be happening too soon. Any sort of wood can be used to make an office desk, not so when it comes to exquisite musical instruments that rely on certain woods for their sonic beauty. C.F. Martin IV devotes considerable time and effort to lobby and educate the natural timbers industry in this regard. Otherwise the 8.2 continues Chris Martin’s personal tradition of using his CEO Series to create instruments that feature progressive technologies and contemporary design that combine with and advance the venerable guitar making innovations of the previous century, to create Martin models of the twenty-first century. 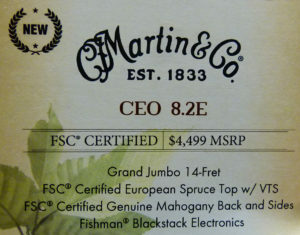 In this case, Martin’s modern High Performance neck is attached via their recently-invented Simple Dovetail neck joint to their Grand Jumbo body size, which was first introduced in 2009. The Grand J took its shape from the short-lived electric archtop jazz models, the CF-1 and CF-2, which appeared five years earlier. The immense mahogany sound chamber of the Grand J design has a round lower bout fully 17” across, and it’s topped by a wide soundboard of European Alpine spruce treated to Martin’s Vintage Tone System, their perfected and propriety method of wood torrefaction. And all of it is encased in a smooth satin finish, with the top decorated by the new Bourbon Sunset Burst, glowing with warmth from its darkest recesses to the golden center that allows the detail in the grain of the spruce to show through clearly, seemingly depicting the unique tone heard from this CEO-8.2. Befitting its impressive amount of cubic inches, bottom bass notes report with substantial body and yet with very nice definition. Never woofy nor muddy, there is a firmness from the bottom E string. It is buoyant, yet taught and strong. The fundamentals across the middle register are well balanced in volume and projection, with the note from each string narrowing in timbre as they increase in pitch, but all three have a fullness that extends the general sense of warmth up through midrange. The sound of the unwound trebles is wholly different yet complimentary, with clear-cut definition and a silvery ring. Digging into them makes them condense and pop, as they bark and bite in a bluesy, old-timey way. But when played with less attack, they are unfettered and sing out atop the voice with undistorted purity, and yet resound with a fluttering resonance, as if the guitar had a built in reverb effect, which I guess it does. But it occurs naturally, and not from electronic special effects or recording studio wizardry. It is a spacious voice, with a bottom end of inherently woody character, as one might expect from mahogany back and sides reflecting and enlarging the expressive sound of European spruce, while keeping things warm yet uncluttered as only mahogany can. 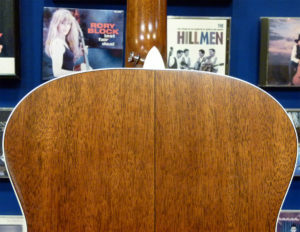 I like to use the term “presence” when speaking of mahogany tone, because of how the sympathetic undertone glowing out from the sound chamber has palpable color and substance, but it is unified and understated, and not nearly as thick or complicated as rosewood sounds. It supports the fundamental notes rather than welling up through or beyond them. Guitars of this size made from rosewood can sound quite lush to the point of being swamped with overtones. The CEO-8.2 has simpler overtones that extend the fundamental register, and a sympathetic undertone that remains unobtrusive while helping define and enrich that expansive 3D soundscape where that clear fundamental tone is so beautifully displayed. European Alpine spruce provides a very quick response, often preferred by makers of traditional flamenco guitars, because of how a note fires off with speed and clarity, and then gets out of the way for the next note. And that quick metallic “ping” stands out at the top of the voice, which some people associate with Adirondack red spruce. But Alpine spruce sounds with its own subtle presence permeating across the fundamentals, which my ear hears as a glow, or almost a pastel wash of pale hue, soft and creamy in contrast to those precise sonic peaks off the unwound strings, which softens their edges a bit. This is even more noticeable since the wound strings are less brassy than on a rosewood guitar topped with Alpine spruce. 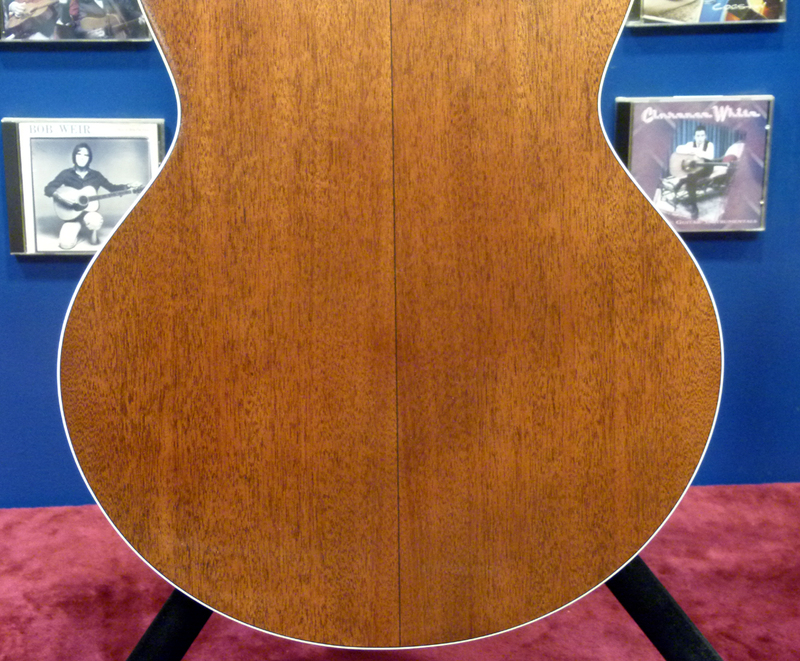 There are many Martins made with European spruce tops, including several models made with mahogany back and sides. None of them sound all that much like this one. And a lot of that has to do with the Grand Jumbo design. 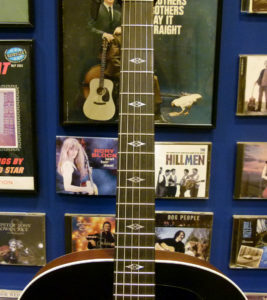 The top on a Grand J is supported by bracing with unique shaping engineered for the wide soundboard. There are three main tone bars supporting the lower bout, one more than on other Martins. The tallest and thickest is closest to the bridge and has the least amount of mass removed though scalloping, and the second bar is shorter and less massive, and the third one is shorter still with the most extensive scalloping. The main X brace is not scalloped at all. This combination of firm support at the center and flexible secondary support has something to do with the distinctive fundamentals and ethereal resonance heard from this guitar. As too does the fact the top and bracing are made of European spruce, which is a bit softer and less ridged than Sitka or Adirondack spruce from North America. And that European spruce top was torrefied by Martin’s Vintage Tone System, which opens up the sound of a brand new spruce soundboard so it takes on properties similar to a top that has been played in for many years. It is why those clear trebles light up such a wide open cavern of tonal space that seems larger than actual room one sits in while playing the guitar, and why that bottom bass note sounds so deep and so projecting at the same time. 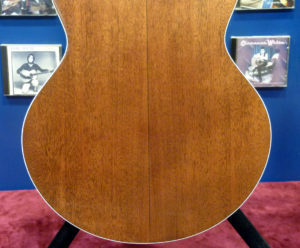 You can read more about Martin’s VTS and the use of torrefaction in modern guitarmaking HERE. As mentioned, the response is quite impressive, as the guitar sounds differently depending on how hard it is played. Fingerpicking is notably pretty, when the strings are picked lightly in a relaxed manner. The notes from the wound strings have that fatter roundness reflected by the mahogany beneath, while the trebles ring out with their chrome-plated clarity, glassy and refined, extending out over and illuminating that airy cavern beneath. But when the thumb and fingers inject the strings with some extra tension, as mine often do, the top voice leaves that undertone behind, and everything condenses at the fundamental, with the mids barking out succinct notes of authority while the cutting high end pops and sizzles. When it comes to a flat pick, the three registers all hold their own, which makes the CEO-8.2 very good for strumming and picking, with that “Poppa sang bass” low E string throbbing at the bottom. And then it sounds even less like typical Martins, including those that also came with liquid metal bridge pins, known to increase volume and sustain – and this big fella has loads of both. This is not a dreadnought voice, as it comes off wider and more spacious. It is not like the sound of the Martin Jumbo, which has a grand auditorium size top and dreadnought depth, and has a focused, punchy voice, like a super-sized 000. And it is devoid of the usual fudgy thickness of previous Grand Jumbo models. While the CEO-8 comes closest, even that does not sound quite like the 8.2. And yet it is a familiar sound, or so I thought. It brought to my mind the Gibson SJ-200 because of how the undertone decreases in presence and color from the bass to the treble, and in the way the midrange and high harmonics dominate the sustain. But once I sought out an example of that model to refresh my senses with its tonal qualities, the illusion fell away. The CEO-8.2 does not sound much like an SJ-200, or for that matter a mahogany SJ-100. It is truly unique, even if was made to look somewhat like a Gibson SJ on purpose. Chris Martin has always admired the visual styling used on certain Gibson models and he incorporated similar aesthetics in his CEO models meant to pay homage to the classic Gibson guitars from the pre-war era. None of them as directly so as the CEO-8, inspired by Gibson’s iconic SJ-200. 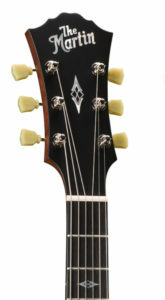 The CEO-8.2 retains some of that same visual flavor, while pulling things back toward a more Martin-like restraint. Gone is the audacious inlay on the CEO-8’s pickguard, while the large irregular shape remains. And the wide flamboyant blocks of mother of pearl filling in the fretboard have been replaced by elegant diamonds with centers made from slender lines of that same lustrous shell. And where the wide, crested headstock taken from the Martin archtop models has a pearl “The Martin” logo, similar to “The Gibson” that appeared on certain guitars from the 1920s, it also has a larger version of the same skeletal diamond inlay used for the fret markers. Even the 8.2’s Bourbon Sunset shading on the top is subtler than the reddish Teardrop Sunburst on the CEO-8, and where the latter has the burst effect extended to the back, sides, and behind the neck, the CEO-8.2 lets the natural beauty of the mahogany show through unadorned, much more like a classic Style 18 Martin. And keeping with Mr. Martin’s ecologically friendly theme, the acoustic-electric version, the CEO-8.2E, is fitted with the new Fishman Blackstack magnetic sound hole pickup, which does not require the use of batteries. And despite its name, it isn’t black. It has a grained cream-colored face plate made exclusively for this new CEO model, which matches the keystone tuner buttons and the overall aesthetics very nicely. The CEO-8.2 is yet another individualistic Martin model from the CEO Series, which combines the familiar with the new, the progressive with the traditional, and matches and marries elements found on other guitars, but never in quite the same configuration. Whether someone is a lover of mahogany, European spruce, large, round guitars, or sunburst tops, this guitar offers something they already love but with a new look or sound, while offering other things that may be unfamiliar but will prove a new love waiting to be discovered.